This was a great issue of Fantastic Four and a great jumping on point for new readers. With all the big things that have been happening with this book i was really floored by this issue and how simple and straightforward it was. It starts off with Reed and Nathan Richards building a device that can allow them to see into the future. But that's it. Reed and Nathan don't get to meet with any future versions of themselves and they can't interfere with what they see. They see New York City at different parts of the future and the two things they see as constant are The Thing and Franklin Richards leading a different group of super humans as the Fantastic Four. It seems that the serum that was created by the first generation of the Future Foundation allows Ben Grimm to return to human form for one day a year. But the draw back to that is that Ben only ages one day a year. This gives Ben a very, very, very, very long lifespan. Around the year 4012 Franklin Richards goes off to work with/for Galactus and leaves Ben on earth and head up the Future Foundation. Ben gives a great speech to the newest class about how they should stop every once in awhile and enjoy themselves. Around the year 6012 Ben Grimms dies of old age with Franklin looking on. Reed returns to the present and realizes that he too should take time to spend with his family and friends. So Reed takes a seat next to bed during a boxing match that is on pay per view and has a beer. Content to be enjoy Ben's friendship and company. All around a fantastic (no pun intended) comic book. It was a nice little break from the big ideas that have been apart of this book since Hickman started as writer. The art is by Ron Garney who we all know the be a very steady hand when it comes to getting a book out on time. 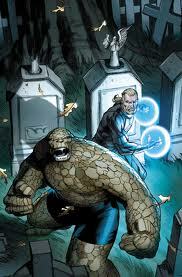 So i am proud to say that if you never read Fantastic Four ever or just dropped the book give this issue a shot.